Those words famously crooned by Michael Stipe in R.E.M.’s eponymous 1987 hit song have come to mind this week as the Supreme Court of the United States ruled gay marriage should be legally recognized in all 50 states. Some might think I’m lamenting the end of defining marriage in a way that, as the Supreme Court itself has noted, has been embraced by virtually every culture in every age. [ref]It is lamentable and I have spoken about it. [/ref] But R.E.M.’s tune comes to mind because the SCOTUS’ action confirms what has been in the works for a while: it’s the end of Christendom. I grew up in a world where the majority was fairly defined by biblical modes and means. The Bible was esteemed, not mocked. Evangelical Christians were embraced, not marginalized. Christianity and its moral ethic were exemplary, not just “someone’s truth.” For the most part, American culture and Christianity more than got along, the former was highly influenced by the latter (aka, an Evangelical Christian majority). But that wasn’t always a good thing. For one, it produced cultural Christians who thought they were believers simply because they adhered to a certain moral code, offered attendance at a church, and agreed to certain ideas about Jesus. However, it was a “faith” which didn’t penetrate the heart. Essentially the church was seen as a club. To say you were a Christian was like saying your were an American…later, a Republican. But repentance, spiritual growth, missional living, and a sense of personal holiness were absent. In fact, being a good church attender was simply a shrewd thing to do – it might help you get more business or raise your social status – everyone can trust you’re a stand-up person. So you joined the church (and Christ) with your body but not your heart. But the Supreme Court’s verdict sends a clarion call to everyone that Christendom in America is gone. That way of life, that type of culture, and the socially beneficial dynamics that went with it have quickly evaporated. 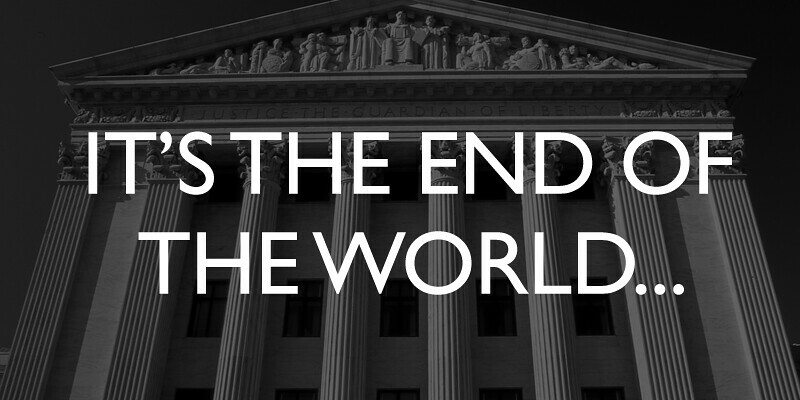 It’s the end of the world as we know it. What do I think about it all? Well, just continue Stipe’s words. Now we will enter into a Christianity that is closer to the one that began 2,000 years ago. It won’t be popular to follow Jesus as King, to espouse a biblical ethic that’s lasted more than two millennia, and say that biblical authority is our rule and faith. We will have to lovingly and graciously demonstrate the gospel in both word and deed by the Spirit’s work instead of being tempted do it by the tools of political power or social coercion, the two things you lose when Christendom dies. Indeed, in the future, becoming a Christian may hurt your business or, at least, lower your social status among other negatives. In short, it will cost you something to follow Jesus. And I welcome it. Great article Yancey. Beautiful words and a great eye-opener for the church. Also love the song ‘Everybody Hurts’ by REM. Thanks for the good,thoughtful insight. Thank you for writing this, Yancey. Great article Yancy, I enjoyed reading it. Thanks for the article Yancey. It was very well written and insightful. I do miss having you as a teacher at Lakepointe. I find your use of Stipes words very confusing as he is an openly bisexual, liberal political activist. He has been using his celebrity to fight for equal rights for people of all walk of life, gay, straight, black, white, and everything else. I was raised to believe that we are all sinners, my rap sheet is as long as anyone else. He who is without sin throw the first stone. When as Christians we claim that He is my one true judge, yet judge others, we are not living his teachings. love thy neighbor, no ifs, ands, or buts. I have dedicated my life to the way my Christ. I will show love and compassion as much as I can. I will stand for the right to love. Until I meet my maker. He is a good god, a god of love. To believe that he would have anything but love for his creation, would make me not want to believe, or come to him. Know that I respect you and your teaching. I’ve been singing this song around the house this weekend. My son keeps asking why. I just smile. I grew up in the Christendom you described, and I left the church because I didn’t have any real faith. I’m happy that America is changing. I want to be American and Christian, two separate things. One by birth and one by faith. Yancey: I came to CCCC as an adult fully aware that Christiandom existed. I had not benefited – we were the black sheep family on the block in many cases. This struck a chord with me from the other side of the fence. I came as an unchurched adult to find a welcoming place in OUR/His Church (CCCC) remnants of Christiandom were around, for many members had that in their DNA so to speak. I am a straight single male but I still felt many barriers including 1) Would they get bogged down in politics that i disagreed with? 2) Would I be welcomed? 3) Did I need prior experience with ChristianDom ? As I attended I found a welcoming place where no of those concerns ever became realities. Our church is a place of love. Also you continually challenge our minds and out hearts. You have a great mind worthy of teaching in a vicinity of high education and learning like League City. I also know several regular attenders that are gay that also love CCCC and your teaching. Thanks for making Christ accessible to those of us on the wrong side of the fence from Christiandom as you say is being destroyed and possibly with good riddance. It could really be a good thing. I thank Jesus for your Instruction and this challenging post. BTW – just bought your book! Excited to read it! Yancey, Fantastic perspective. Real Christians … time to get real. That’s what I read. And the time to get real is now. Thank you for your words of exhortation. Falling to my knees & praying for revival has been all I can think/do this weekend. While the rest of the world around me continues to move as if nothing has changed, I’m frightened for my friends & family. Kids who grew up with mine & went to Christian school for 12 years are cursing the Christians for our reactions. I see the club cards now. A sad day but an awakening is here. I’m walking to the little church in my neighborhood today. First, Steven, about the use of the song. Sorry it was confusing but I was simply using R.E.M.’s song for its lyrics without trying to say how much I either agreed or disagreed with what Stipe or the other members of R.E.M. believe. That’s it. Second, to both of you, I appreciate your thoughts about the “way of Christ” but it seems built to some degree on the idea that these handful of ideas (e.g., “judge not…”; “cast the first stone”; et al.) show us Jesus and the story is settled. Therefore, Jesus must love everyone and doesn’t expect them at all to change. Furthermore, unconditional love means unreserved endorsement for anybody and anyone’s beliefs and lifestyles. The only problem with that is it’s both untrue and unlike the Jesus of the Bible. For example, the place in the Scripture (Jn. 8) where we see Jesus with the woman who was caught in the act of adultery (is this the “gal pal” you’re thinking of Steven?) is where we see Jesus utter the famous words T Cotton references (“…cast the first stone). To quote it makes it seem like Jesus never says we should deal with sin, yet to read the rest of the passage is to see exactly the opposite. Jesus recognizes not only was the woman sinning but explicitly calls her “to go and sin no more.” Why? Because, according to Jesus, it is good to call sin as sin and for those who want to follow him, they should seek to obey more and sin less. The point of the example is that it’s easy to quote general ideas about who Jesus is and make him fit our mold when, in actually reading through the Scripture itself, we see that Jesus likely breaks it. For you and me. Jesus does love unconditionally but his actions and words from the rest of the gospels (not to mention the rest of the New Testament) show us that unconditional love doesn’t mean unreserved endorsement of what we think is good, right, and loving; on the contrary, it means to discover what God says is good, true, and beautiful…and how he defines love…and to live under that as a citizen of the kingdom of his beloved Son. That’s why the “way of Jesus’ is walked upon with the steps of repentance. Something I’m trying to do every day. So you’re telling me that because I support the government interpreting the constitution of this country to include extending the civil marriage rights granted by the government (not the church) to same gender couples, I cannot be considered a faithful Christian? Tell me how I’m reading what you’ve written incorrectly. I’ve served in your church for over 10 years. I’ve heard you preach that mercy triumphs over justice. It sounds to me like you’re telling me I have to go. And it sounds VERY MUCH to me like you’re preaching a different GOSPEL. And I understand FULLY that serving in your church is no measure of my relationship with Christ. Neither is our faithful giving. I understand the Gospel and have walked with Jesus through thick and thin for nearly 60 years. The arrogance of your writing is astounding. Thank you for the prayer Yancey. Please know you have been in mine as well. I know this is not an easy issue. I have survived at CCCC because of the understanding that we can agree to disagree about a multitude of things. Yes, I have a passion for mercy. I am not blind to the ravages of sin in our lives. I am also certain that God’s grace reigns over all and that our “theology” and “doctrine” are too often more about a denomination (or network) than the character of God (which I believe is dangerous to codify with absolute certainty). I believe we ignore our LGBT brothers and sisters in Christ at our own peril. The Holy Spirit is active and moving in powerful ways in their community. And yes, may we both follow Jesus, the WORD, in a way that brings him glory. Hey Yancey! Awesome to hear from you! Thank you for your blog entry on this subject. Your words give me (as well as others with whom I have discussed this matter) comfort. These are amazing times for believers to be alive; witnessing the ever accelerating changes…And I/we feel fine. Amen, my friend. @ Christine There are plenty of LG at CCCC. They are welcome and love the messages they find. I am very glad to hear that Mark. And am especially thankful if you are gay and speak from your own experience. To Yancey…I want to apologize for using the word “arrogance”. I realize that while my intention was to apply the word to your writing and not you…it’s a distinction without a difference and I should not have used the word. I do not believe you are an arrogant person.